LG recently unveiled its new Android-based LTE device, Optimus Vu. The launch has taken place prior to the Mobile World Congress, which has been scheduled for February 27, 2012. Optimus Vu offers tablet-like viewing with smartphone portability. It consists of a 5-inch IPS display with a resolution of 1024×768 and a 4:3 aspect ratio. It runs on Android 2.3 Gingerbread at present, but will be upgraded to Android 4.0 Ice Cream Sandwich soon. It features an 8 megapixel rear camera with AF and LED flash and a 1.3 megapixel front-facing camera. 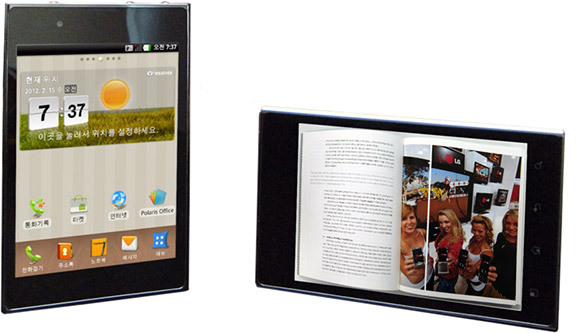 Optimus Vu has a 1.5 GHz dual core processor with 32 GB of internal memory. The device is 8.5 mm thin and it comes with a 2080 mAH battery. Optimus Vu will be first introduced in Korea this March and will also be showcased at the forthcoming Mobile World Congress at Barcelona. The price of the device is not yet available.